More vintage Greece Town for your retro mall viewing pleasure. This time an exterior view from nineteen and sixty eight! Another great interior shot from "The Mall" (now Arnot Mall), in Horseheads, with its unique draping Spanish gardens looking vibe! Truly a quintessential 1970's shopping mall photo. Well I hope everyone had a nice and SAFE Memorial weekend! I return to the blog a little later than I planned, due to some severe weather we had blow through Metro Detroit yesterday (Tuesday), that went and knocked out our power for a good portion of the day. And of course, it had to be almost 90 degrees out, too, with super high humidity! Ugh. It was a loooong day, let me tell you. But the AC is cranking again now, and I have my computer and internet connection finally back, so I'm good to go! 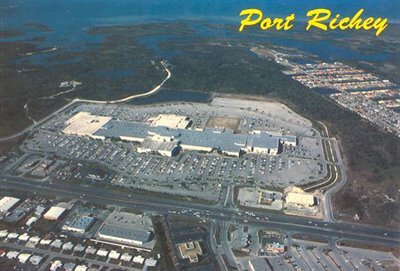 Kicking things off here with a cool aerial view of a mall I haven't featured before. And it's a bit more of a modern-era one for a change, having first opened only in 1980. And dig this mall's location, too! Looks quite exotic and spectacular to my landlocked eyes. 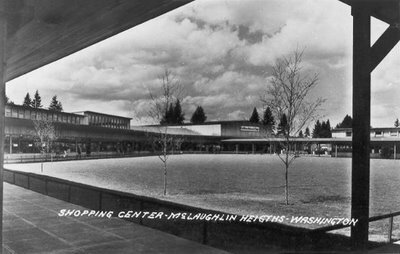 Dating back to 1949, this mall is now recognized as one of the first actual modern shopping centers in the United States. Love that sign! Anyone know if this one is still around today? I didn't have much time to look into it yet. 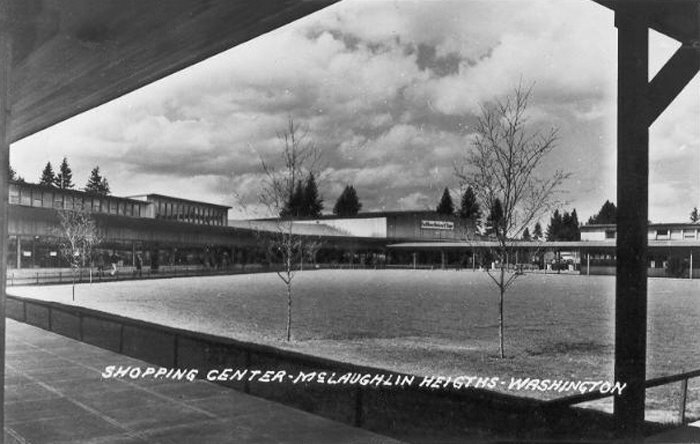 Mall history: 1949 - ? 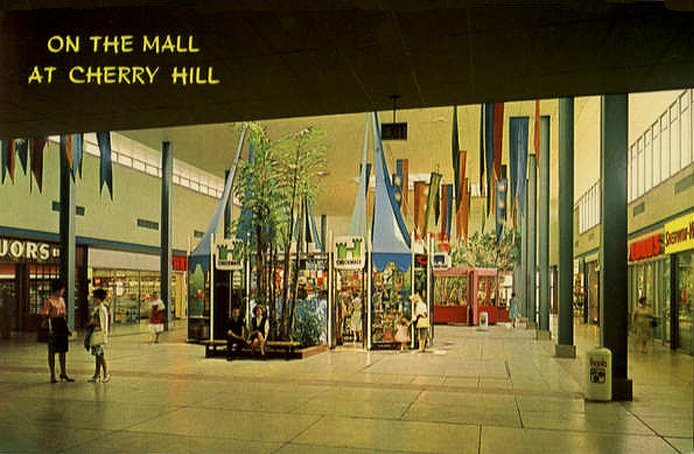 "A short documentary film about a very unusual mall in NJ, full of strangeness and colorful characters." 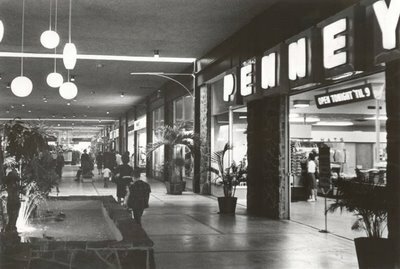 Short film by Robin Groves, on the venerable old Bergen Mall. Well done. Very nice job, Robin! 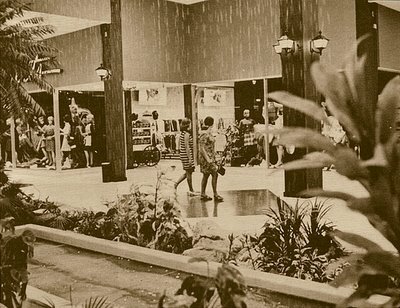 This mall began its retail life as an open-air shopping facility, originally dubbed the Seminary South Shopping Center. 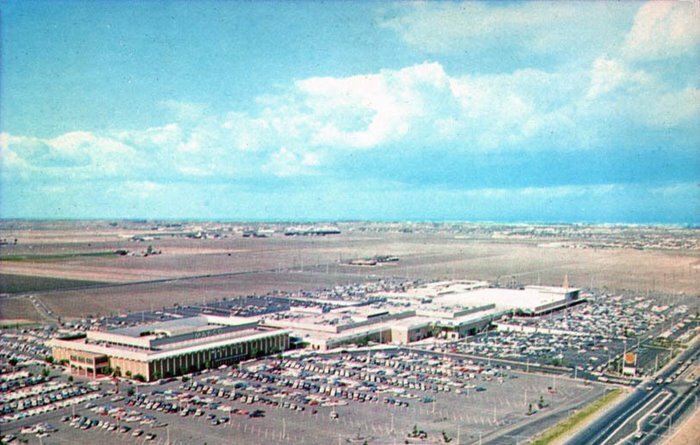 Later it became the Fort Worth Town Center, and is now being completely revamped and remolded into a whole new "lifestyle center" type beast, called, La Gran Plaza (they liken it to a Mexican-themed "town square"), consisting of supermarkets, cinemas, and a Rodeo/Concert venue arena. Yes, I said a Rodeo/Concert venue arena. Well, it is Texas after all. Developer: Thos. 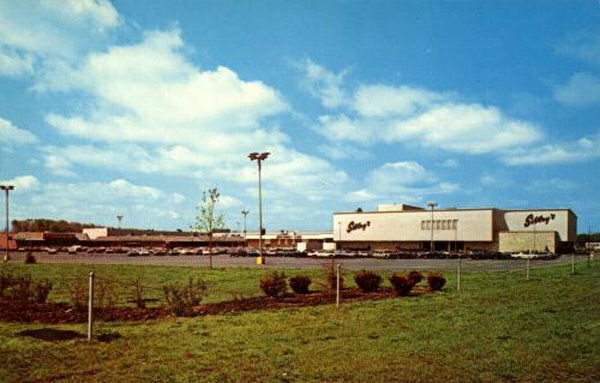 S. Byrne, Ltd.
(Description via Movie Grooves) During the 60's & 70's, advertisers were coming up with some innovative ideas to market their products. One of these was the production of flexi discs that contained pop music that also advertised the product. 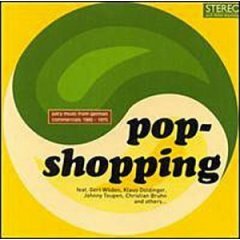 Popshopping 1 brings together these highly collectable, incredibly rare and fantastically groovy tunes for the first time. The CD/LP also contains some great tunes from TV adverts. All together now - "Mouuu-liii-nex!" (5 stars!) "What a trippy disc! This is the kind of compilation CD that's great for cocktail or '60s/'70s-themed parties. 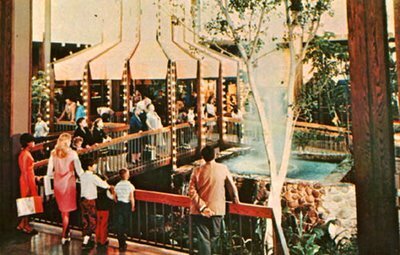 It's chock full of German commercial jingles from the '60s and '70s, and they're so funky! You don't even need to know German to get into the groove. And how can you not laugh at a song called "Komm In Fahrt"? Groovilicious!!!" (5 stars!) "Groovier than the seventies! This album is so much more than seventies hit cavalcades can provide! Groovy camp, or what can one say about Minikillers? And what an earth were they? Nevermind. Feels good!" Oh I just had to mention this CD here at MOA! :) Very cool stuff! And it goes perfectly with those vintage shopping radio spots I posted before, and the old Kresge music recording, too. Samples from Pop Shopping are available at the Amazon link below. Highly recommended. Great kitcshy, vintage shot of the "Gazebo Court" at Eastfield Mall, that looks like it was shot in Technicolor! 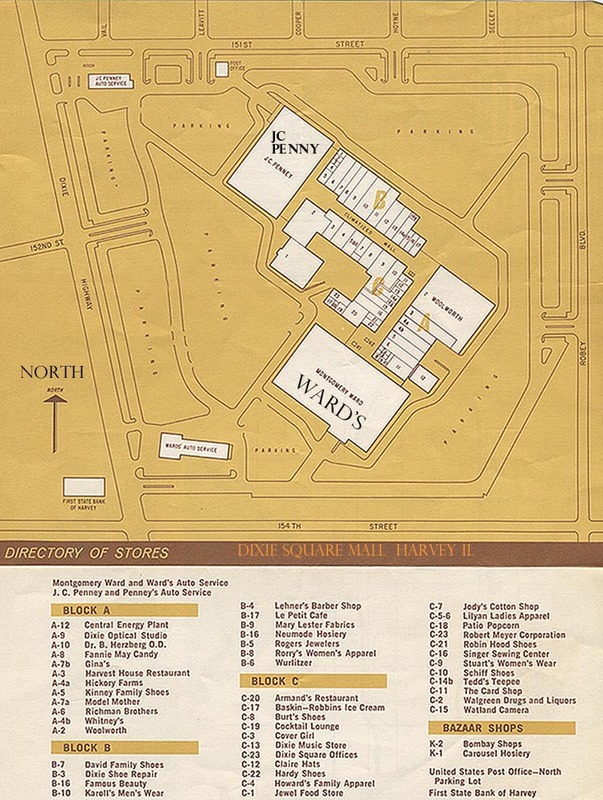 Here's another new mall for the archive here that I hadn't yet blogged (there are actually still many of them left)! 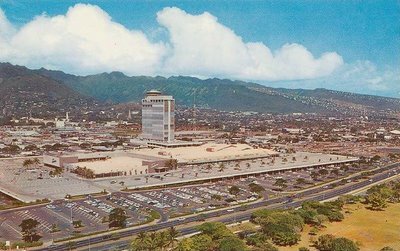 Once-thriving (ad at left is circa 1973), but aging in the '80s, Eastwood Mall was renovated in 1989, pumping fresh life into it for a while, but alas, it didn't stick in the long run. 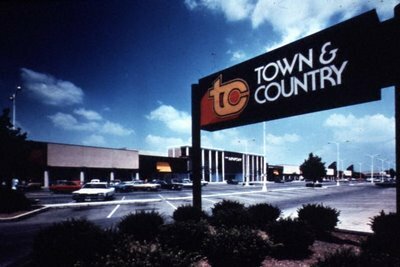 After steadily losing most if its tenants by the end of the 1990's and early 2000's, the mall was finally closed to shoppers for good in 2004, and is now awaiting (or just undergone?) imminent demolition to make room for a Wal-Mart. What else? 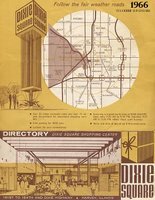 "Independent film company Paw Filmworks has been in production on the documentary film "Dixie Square" since June of 2004. The mall, made famous in the 1980 film "The Blues Brothers", was open for business for just 12 years when it closed in 1978. 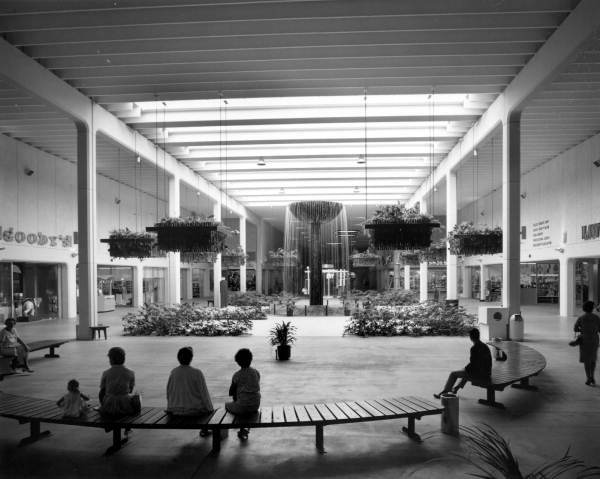 Today the mall still stands, abandoned for 28 years, twice the amount of time it was open. 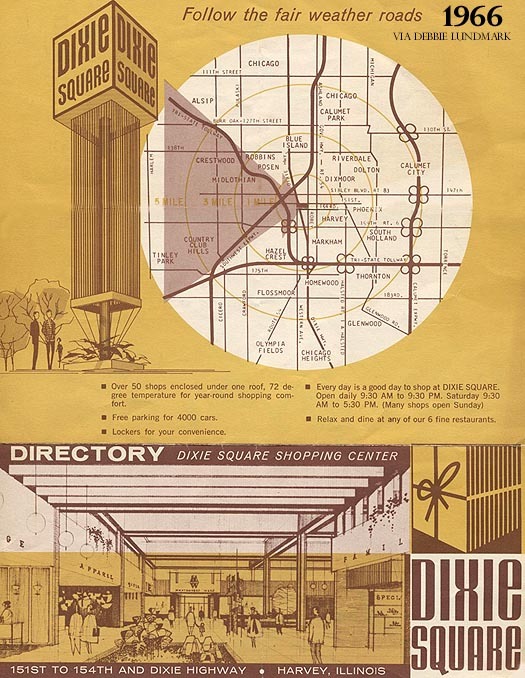 The film "Dixie Square" documents the history of the land and the reasons behind how an 800,000 square foot structure could be left to rot for almost 30 years. The film is scheduled for completion in November 2006." Unfortunately this photo isn't the best quality (I'm looking for a better one), but it's a mall I haven't covered here yet so I thought I'd get the ball rolling with it and add it to the archive. Opening day also presented challenges. "It was a fiasco," Klotz said. A water main break early in the morning cut off water to Smith Haven and led town officials to propose cancelling the grand opening because the sprinkler system and toilets wouldn't work. "I told them, `We can't cancel it. Thousands of people are going to show up and you don't have enough police officers to turn them away,"' he recalled. Town leaders agreed, allowing Klotz to invite volunteer fire departments to encircle Smith Haven with pumper trucks in return for allowing them to ask shoppers for donations, and to set up bucket brigades to keep the public toilets filled while a work crew fixed the broken water pipe by mid-afternoon." Wow. 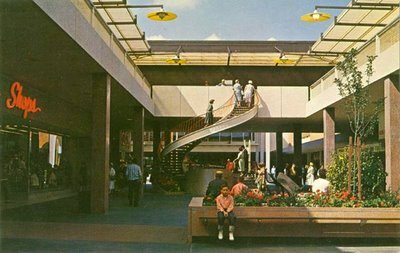 The entire article, The Malling of Long Island, is a great read, btw, if you're interested. 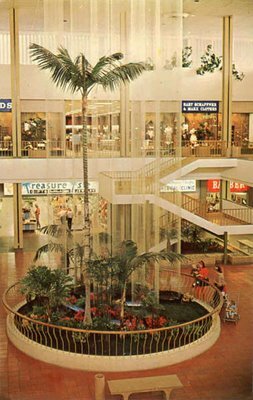 Here we are in the exquisite East Mall wing of Lloyd Center, with that great winding stairway (to heaven?) visible in the background. You can also see it from the opposite angle in previous entry #2 below. 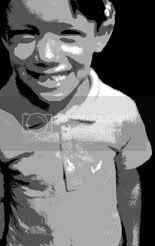 New York area Mays discount store Back to school TV commercial. Source for this clip says it dates from 1978 to 1981. Just by my gut feeling, I'm gonna split the difference and say it's around 1979 (maybe 80-ish) and leave it at that. It's from somewhere right around there at any rate. 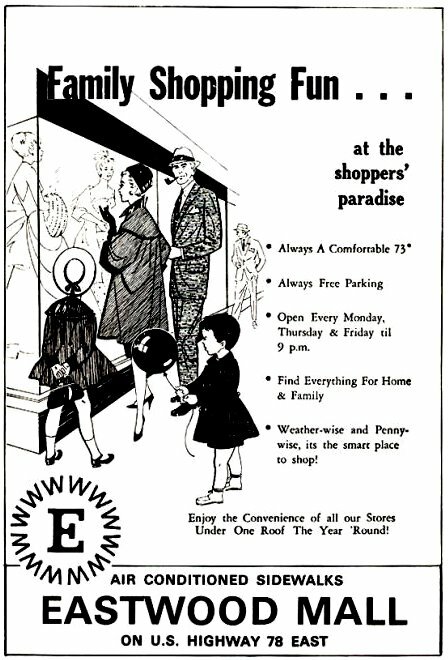 Mays stores are no longer around, but they had some funky cool commercials! 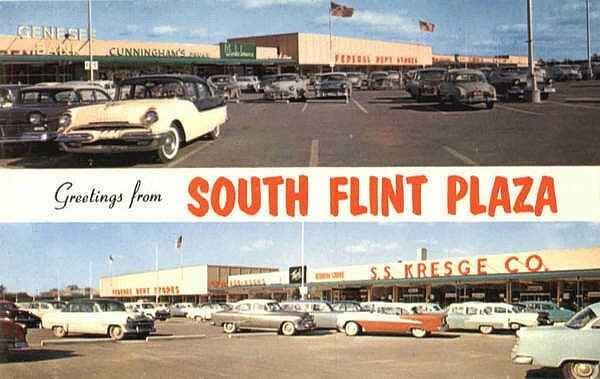 Greetings from South Flint Plaza! And just look at all those glorious old stores visible in this one postcard... Cunningham's Drugs, Federal Deptartment Stores, S.S. Kresge Co., among others, and even a Genesee Bank, to boot! :) Not to mention the cars. 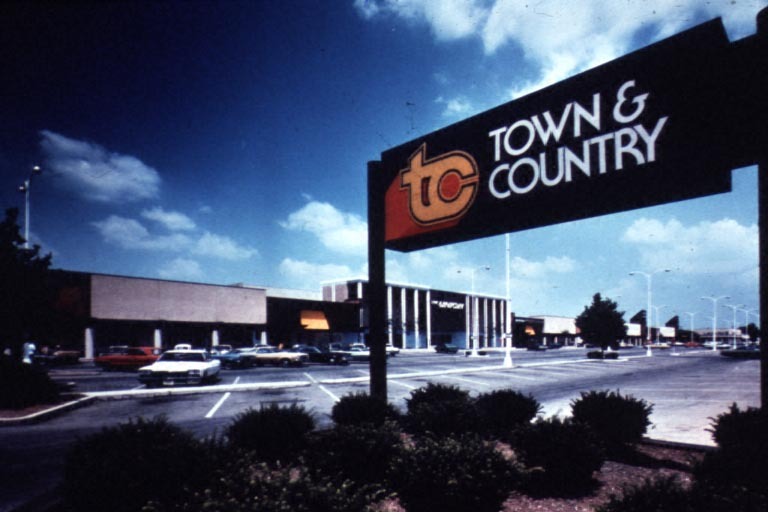 This shopping center is still there today, though I'm finding no official website for them so far, and am still looking for more details as to when the place was originally opened, and all that. Not seeing much yet. I'll update when/if I dig up more. In the meantime, here a current aerial view at least. Swing Shift (1974) is a weird little gem of a short film by stop motion genius, Mike Jittlov (also director of the popular underground cult film The Wizard of Speed and Time), that combines stop motion, live action, and an old department store. 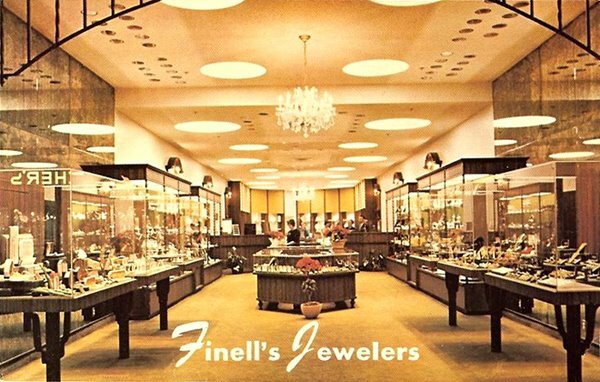 When the store is closed, the lights all out, and the clock strikes 12, this place truly takes on a life of its own! 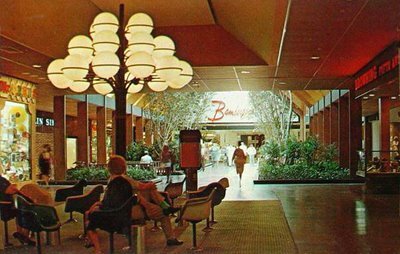 I'm sharing this today because it has some nice vintage '70s footage of the old Broadway Department Store, where it was filmed, and additionally because it captures some of that neat-o retro shopping vibe I'm trying to relive here at MOA. And cuz I also just think it's pretty dang cool. :) Enjoy! 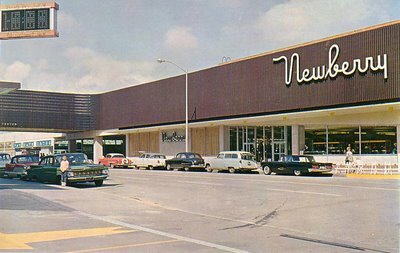 Great shot of the Newberry store at Lloyd Center, early on in the mall's life. I see a drug store way out there in the far-left corner and when I zoom way in, the name appears to be "Pay: Save Drugs", I think. Something like that anyway. Can anyone corroborate this? Things to love in this photo: 1. 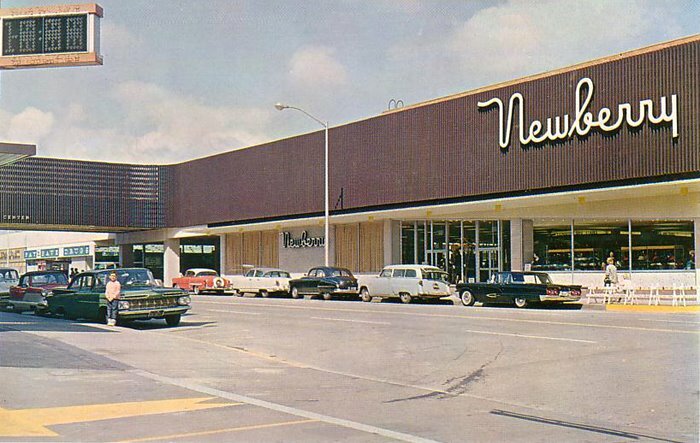 The kid next to the car on the left, 2. the cars!, 3. that great Newberry font, 4. the digital clock (I assume that's what it is) hanging in the upper-left corner. 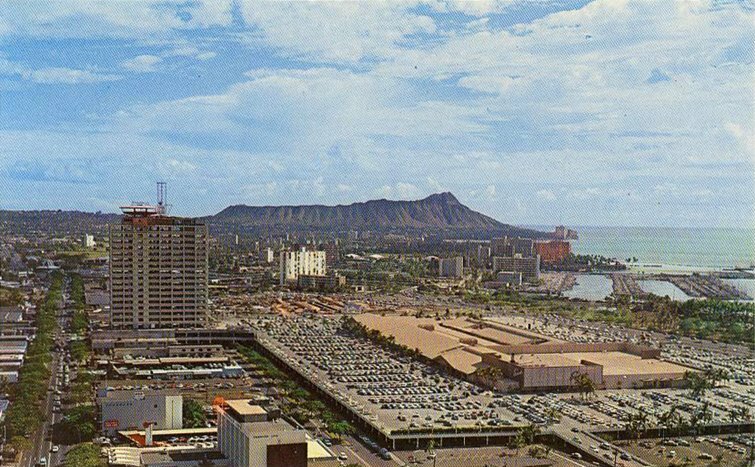 Update: Thanks to the ever-sharp and historically-minded MOA readers here, I now know that that itty bitty store back there on the left is a "Pay’n Save" Drug Store. Thanks for the help everyone! 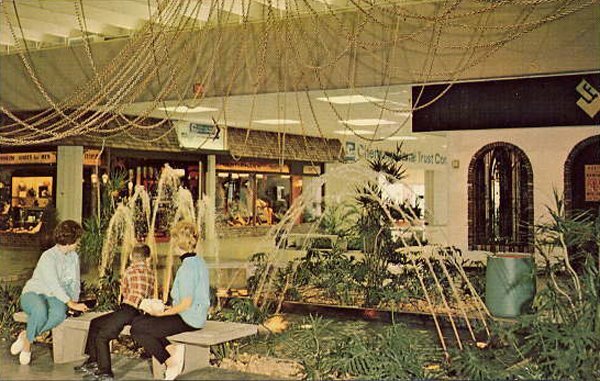 What a super-funkedelic interior this mall had! 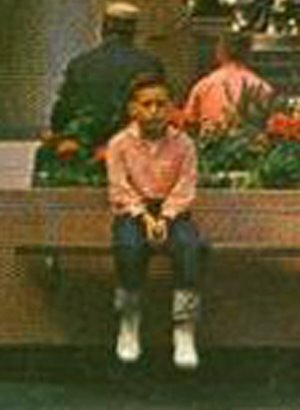 As evidenced by both this photo, and the one in the previous entry below. I love the gaudy, tacky vibe of this place from what I've seen so far (I have more, too). Truly far out! 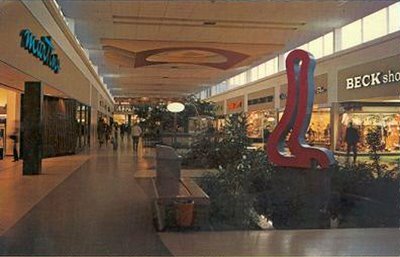 Of course, throughout the '80s and '90s, this mall underwent major expansions and renovations, and was eventually renamed, Arnot Mall. 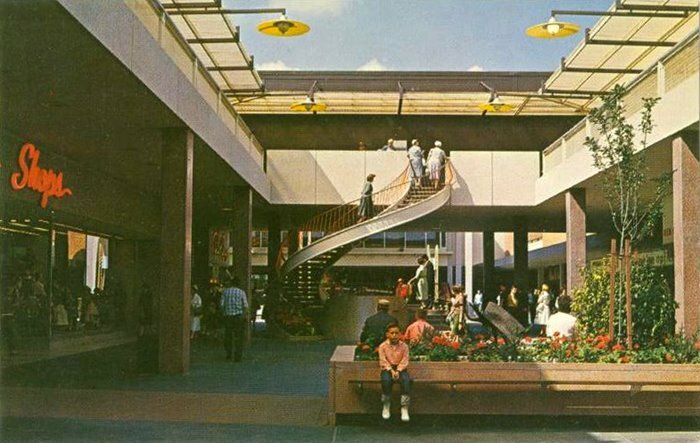 Needless to say, it looks nothing like this anymore. Unfortunately. Some humble little shopping center in Washington. I'm not sure which one this actually was--photo just says what you see here. Still, I like it so I thought I'd add it. 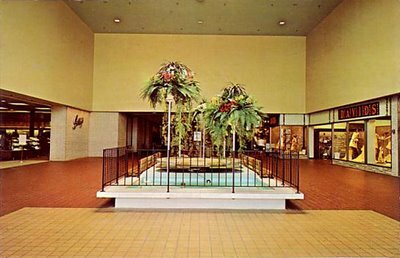 Alberts clothing store is just visible on the left, and a fountain in the foreground, here in the retrolicious center court of the old Fort Saginaw Mall! 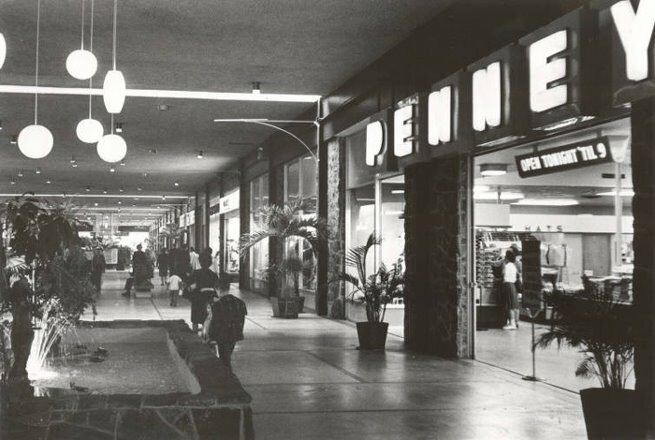 Though this mall may be no more, for those Michiganders who knew and loved it back in the day, the memories will live on forever. Carlsbad, California - '60s or '70s? Vintage postcard advertisement showing the radiant interior of the Finell Jewelers store, in the May Company Shopping Center (researching more info on this mall right now--if it's still around, the name is changed, I believe). 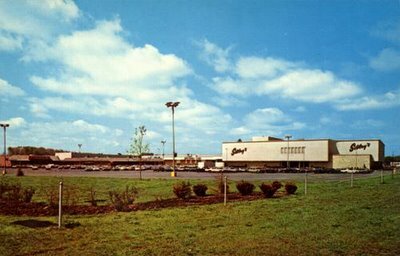 Sibley's & David's stores (left and right, respectively) at the rather spartan looking entrance to the old Greece Town Mall, which was merged in 1994 with Long Ridge Mall, to become The Mall at Greece Ridge, which is how it stands today. 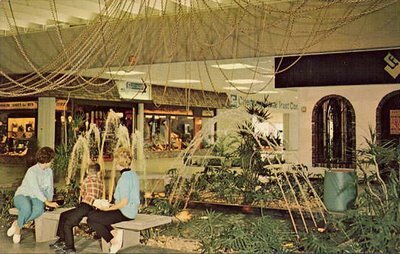 I'm not sure exactly what year the original Greece Town Mall first opened, but I do know it was definitely around in the late '60s. Vintage aerial view of South Coast Plaza, with the May Co. anchor store on the left side. Way down there in the lower-right corner, you can just barely make out the mall entrance sign. And though no real details emerge, I blew it up for a closer look (at left). At least we can see the general shape of it easier. I'll see if I can't dig up a nice clear shot of it sometime. 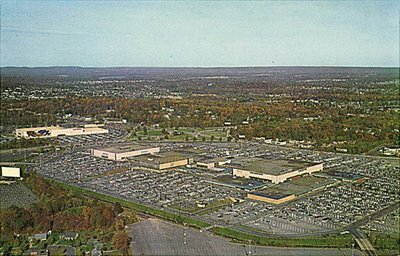 Early '60s Garden State Plaza aerial view. If you click on the aerial link below in this post (and all previous and future ones, for that matter), be sure to always check out the "Bird's Eye imagery" feature as well, when available. 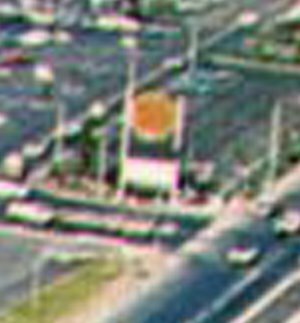 You'll see some really great, low-level images with this! Something a little different here. This is a postcard shot of an outdoor pedestrian mall shopping center in Oregon (see the Woolworth's over there?). 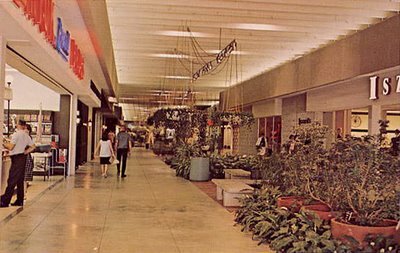 Not an enclosed mall, but it's just so groovy I had to post it! 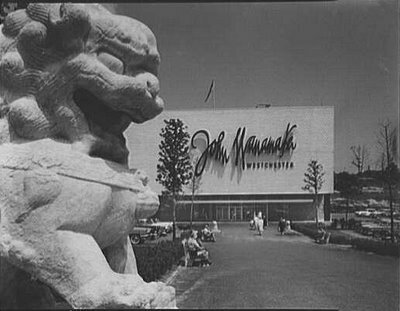 I have no idea if this place is still there (I'm guessing it is), as I was unable to find a website for it. Postcard simply says "Eugene Mall, in Eugene, Oregon", and a check online doesn't seem to turn up any particular mall by that name these days (I'm sure someone out there will know anyway). But whatever, just gaze at this swanky retro goodness, gang. 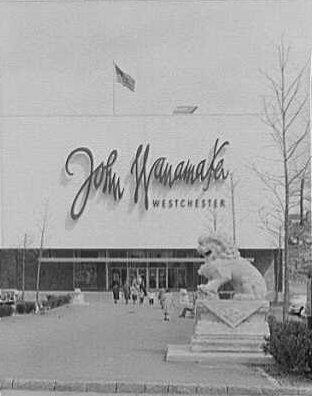 Very moody and stylish shot of the entrance to the Wanamaker store in Cross County Center, taken when the mall first opened. Another great Wanamaker shot. Quality isn't the best on these, but to me, the photos more than make up for it! They don't appear to have much of a website right now, but maybe that will change as their current major renovation and expansion project gets closer to completion (scheduled 2006--2009). 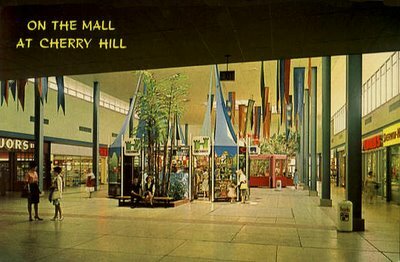 Postcard caption reads: "A view of Market Court where colorful gay Kiosks display unusual and fascinating gifts from many lands." 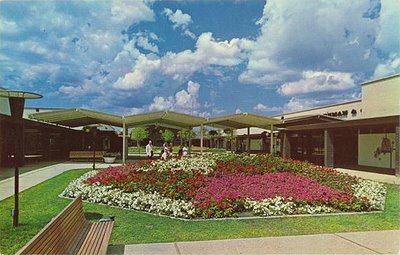 This venerable old shopping mall hit on some very hard financial times in the '80s, and was completely overhauled and redeveloped, beginning in 1997, and has since been transformed into the, Winter Park Village Marketplace, an outdoor open-air lifestyle/market complex, complete with loft apartments, stores, restaurants, hotels, and more. 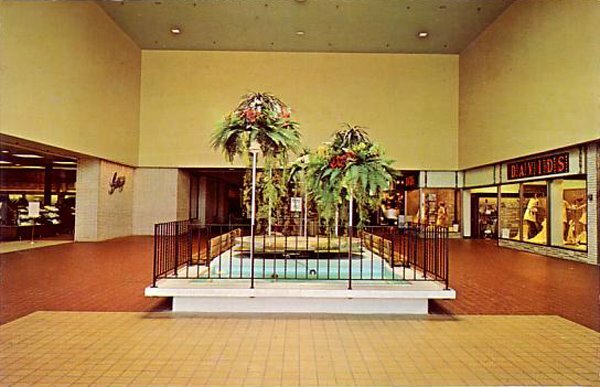 So, alas, the Winter Park "mall" is no more (including that incredible fountain). Long live the real WINTER PARK MALL! Now prepare to have your breath taken away by this stunning shot of the towering Winter Park fountain! 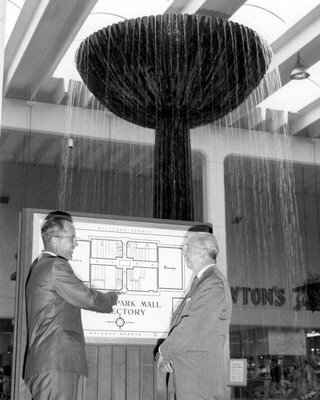 Since even the source had no exact date for this photo, I'm gonna guess this picture of two businessmen (or developers?) 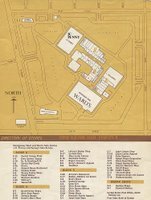 looking at a mall directory map, was probably taken around the time the mall opened, which I believe was around 1959 or so. Just an amazing photograph! 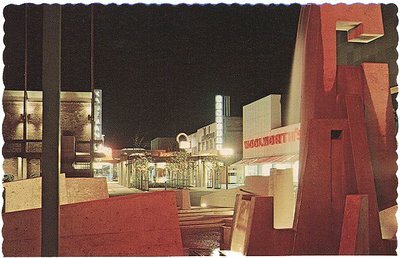 Another shot of that great Topanga Plaza fountain! 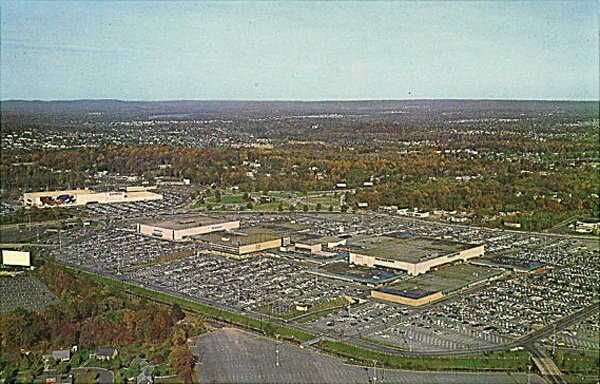 And here's a current aerial view of the mall.